ANGLERS ARE A GIFTED LOT. ON OCCASIONS, WE ARE ABLE TO KNOW PRECISELY WHERE TO CAST FOR AN INSTANT STRIKE. SOMETIMES, WE CAN EVEN FEEL IT WHEN IT IS GOING TO BE A GOOD FISHING DAY. For some reason, I felt extraordinarily buoyant about this trip. As our boat headed out to sea, I drew in a lungful of the salty cool dawn air and savoured its flavour of a promising day. Once we hit open waters, Kevin and I set out a trolling line each, to cater for the mackerel breakfast crowd. As our deep divers plunged, the rods bowed courteously, with the tips nodding vigorously in rhythm with the wanton wiggle of our lurid lures. We had tried trolling before on our previous trips here, and have never been successful. But on this particular day… I had a good feel. Postcard-pretty Paka. Beautiful blue waters with matching skies. About half an hour out, Kevin’s rod suddenly dips and creaks into a gentle curve. Instantly, my rod does the same. Double strike! Our voices roar above the engines in hollering for the skipper to halt. As the boat stops, I yank my rod out of the trolling tube and there is this wild, pulsating sensation coming up the braid. Fish on! My heart shifts to a pounding pulse to match the terrified tailbeats, while Kevin is also forced into a morning workout by his fish. Although tenaciously thuggish, both our fish are outgunned by the powerful reels we were using, intended for mega macks. After a brief but thrilling spar, a pair of pre-teen dorado show up on the surface and are quickly brought aboard for a morning mugshot. Early morning catch. These two dorado probably wished they had just stayed in bed. Shortly after that refreshing flurry of activity, we arrive at our first stop near an unjam, a purpose-built FAD made with huge clusters of submerged coconut fronds. The deckies promptly send down their multi-hook jigging rigs to get us some baitfish, and starts pulling up strings of ‘em right from the first drop. After awhile, we notice that some of the hooked baitfish were coming up “body-less”. Something had chomped them off on the way up, leaving only their still-gasping heads on the hook. Awesome! We rigged up swiftly and lowered our barbed offerings. Almost immediately, Kevin feels a take and announces, “…here it comes, here it comes…” Then, he makes a scathing strike and “kraaaack!” His PE 4-6 rod snaps in two! We are all stunned silent for a moment, before someone shouts “It’s still there! Reel! Reel!” Kevin makes an earnest attempt to retrieve, but turns white from the effort after awhile because his shortened rod is no longer able to bend to absorb the raging runs of the maddened fish. He hands the fight to James, who goes down on his knees, not in submission but for better leverage from the lower centre of gravity. From the smoking strain on both man and tackle, it is obviously a fish that would be worth every cent Kevin paid for his now worthless rod. James fights the fish arduously, making meager progress as the pelagic perpetrator rips off metres of line with every feet he reclaims. But gradually, the biased trade levels up and then slowly tips in his favour. After several profitable minutes, James earns the sight of a finned torpedo rising regally to the surface. Again, we are all stunned silent as this burly beast brashly swims by, indignantly eyeballing us. A cobia! James muscles it closer, making sure it gets no chance to dive. One of the deckies appears with a gaff and makes an agile swing with it, connecting instantly. A heave-ho later, the rod-ravaging rascal is doing a solo of the tantrum tango on deck. While being mindful of the sinister spikes on its back, James and Kevin cradle the massive fish and pose as joint champions with the trophy. James and Kevin are the Cobia Champs of our trip. As odd as this may sound, we didn’t have time to celebrate. Just as our heart rate returned to normal, another cobe hits one of the rods and pandemonium breaks out again. The ensuing mayhem is of a noticeably lower scale, resulting in a commensurate fish being raised easily. Although we were deliriously delighted with our day so far, we believed it could get better, so we started hoping for some mean and meaty mackerels to come along. As if there was a genie onboard to grant our wish, Kevin hit one an hour later! The mighty mack wrenched the rod into a crushing curve and tore off line as though ripping out the wailing reel’s intestines. Kevin grits up for a fight where failure was not an option. If he lost this fish for whatever reason, the dunce cap would surely be his for at least a week. Either by skill or in reflex to the prospect of merciless humiliation, he made all the right moves and before long, a sleek macky is stretched out in surrender on the surface. Changing its status from “opponent” to “guest-of-honour”, Kevin welcomes it aboard and accords it a comfy, cool spot in the icebox. Kevin’s arms were still sore from the fight, so James lends a hand with the pose. VARIED BY-PRODUCTSConvinced that we were parked over a piscatorial dining area, we intensified our efforts and raised a total of four cobia and two mackies. In between all that, we also caught a variety of kilo-odd bottom fare and a few frisky squid that attempted to devour our livebait, getting themselves foul-hooked in the process. Eager for more, I lowered another terrified livebait into the abyss below our boat. I felt its frantic tailbeats throbbing up the braid, followed by the distinct thud of the sinker hitting bottom. As I set the line, I noticed that the vibrations from my jittery baitfish had stopped. Puzzled, I lifted my rod slightly to give the rig a little tug. Without warning, my rod loads up and threatens to jump out of my grip! In reflex, I strike once, twice… and once more for good measure. Hookup! I could tell right away that it was a modest fish, although it tried very hard to impress me with a series of pounding pulls that only went as far as the bend on my rod. Unperturbed by such petty resistance, my robust reel effortlessly cranks up my bounty – a spirited barracuda of about two kilos. The feisty barracuda that added some colour to my day. After a simple but hearty lunch onboard, we moved to another purportedly prime location. We deployed two free-spooling lines armed with dual-hook drifted livebaits, while the rest of our gear remained dedicated to bottom fishing. I thought a balloon rig might also prove potent here, but when I looked into the tackle bag, I found that I had brought none. Rats. Time to improvise. I grabbed one of the supermarket bags that contained our snacks and emptied its contents. Blowing in some air and tying it up… tadaa, I had a “balloon”. As my “trash bag” rig caught the current and drifted off, one of the puzzled deckies asked, “What is that thing?” I casually replied that it was my balloon. Either from good upbringing or being plain dumbstruck, he just smiled and didn’t say another word. Good man. Although I suspect that my less kindly friends would not have let me off that easily, they never got the chance to snigger, ‘coz a minute later, one the rods crashed into a crippling curve. As the reel went into cardiac arrest, an explosion erupts twenty metres astern, with a ballistic fish bursting through the spray. There’s just no mistaking that glorious gold and green sheen… dorado! 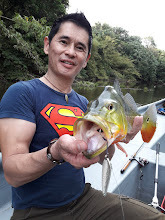 The rod is quickly handed to Mr Koh, as the deranged fish continued bucking on the surface like a bronco with a burn on its bum. Mr Koh fights it like a cowboy, and although it didn’t come easy, he eventually manages to steer his steed alongside the boat. Our adept deckie again does his marvel kung fu with the gaff and up comes a very, very displeased dorado. A celebratory shot with part of the day’s pickings. Inexplicably, nothing else happens for the next hour or so, which was really odd as we are told that dorado usually hunt in packs. But right after the lull, a slick of them arrive and more than make up for our lost time. Bored with the inactivity, Kevin decided to retrieve his rig and change the bait. But just as he touched the rod, it throttles into a steep stoop and the reel begins wheezing. He grabs the rod and whips out a strike in one swift motion. The fish responds with an aggressive aerial maneuver, propelling itself clear out of the water in true dorado dementia. While a lesser angler may have been intimidated by such display of bestial behaviour, we are reminded here that Kevin had been seasoned by his earlier accomplishments of that commando cobia and majestic mackerel. It was no surprise then, that he breezed through every splash and dash that his opponent discharged, to claim his right to strike a victorious pose with his conquest. Kevin makes us green with a gorgeous greenie. As soon as the dust settles, my “trash bag” rig gets mugged, with the rod bearing the brunt of the beating. The fish is a rogue, bouncing brazenly on the surface in an arrogant dance that could only be choreographed by a despotic dorado. My rod is hurt to the hilt and my reel retches from the strain, but working in combo with my determined demeanour, the fish is successfully brought to heel. As Kevin takes my glamour shot, James hits another draconic dorado! Unbelievable! It was as if they were waiting in a line to maul our baits. Things got really chaotic just about then and that is when I stopped being able to keep track. There was just too much going on! By the time my head stopped spinning, we had decked a total of six dandy dorado. All I remember is that everybody was smiling. The bull dorado that locked horns with me… and lost. After such stupendous success, we pretty much didn’t care what happened next, preferring to just watch the setting sun dress our day in the golden colour it so truly deserved. As we headed back, I sniff at the crisp sea breeze and pleasantly catch the scent of the same good feel that I had in the morning. See? I knew it was gonna be a great day. Our previous trip yielded a deckful of tuna, among others. Nice trip. Was and is still up to my neck with work if not I would have join you. When will you be paying Pure Fishing a visit? Will buy you makan.